"Burn like fire. Flow like water. Dance like the wind. Stand with the strength of a mountain. Do all these things, and the wisdom of the universe will be yours." The ancient temples of the clans hold the deepest secrets of magic. For centuries the shugenja of the clans have practiced their arts, communing with the spirits of nature and learning ever more potent ways to work their miracles. For those who embrace the teachings of these ancient temples, anything is possible. * New shugenja prestige classes, new Paths, and new Advanced Schools. * New abilities, feats, and techniques for both the Legend of the Five Rings RPG, Second Edition and thed20 System. * Benefits for attending shugenja temples that customize your character. * Details on the most influential sensei of each school in the Empire. 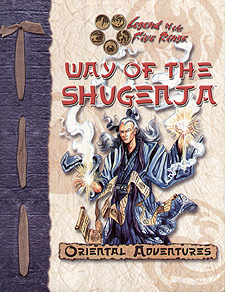 This book is a duel-system supplement for the Legend of the Five Rings Role-Playing Game, Second Edition, and Rokugan, the d20 Companion for Legend of the Five Rings. Players and DMs may also find it useful as a source of interesting new feats and abilities for any d20 System campaign. Game Masters running the Second Edition L5R RPG will need a copy of the Legend of the Five Rings Game Master's Guide and the Player's Guide. Players need only the Player's Guide. Dungeon Masters running d20 System games will need a copy of the Player's Handbook, the Dungeon Master's Guide Oriental Adventures, and Rokugan. Players will need only a Player's Handbook. The kami await your call.